I am always intrigued by new burger places, how are going to take something that is so popular, so familiar and take it to the next level? Upon first glance, M Shack does a pretty good job at reinventing the classic burger, with toppings like "Hoisin bbq glaze" and "truffle flavored portobello mushroom with sherry glaze" they definitely get your attention. Along with burgers, M Shack offers a few other options like gourmet hot dogs, chicken and fish sandwiches, and salads. You also get to choose from mouth watering milkshake flavors like "banana's foster" and "Marshmallow brulee." The atmosphere is modern casual with counter service and numbered seating, you also have to order your sides separately which frankly was kinda a bummer (if you ask me a burger should always just automatically come with fries...it's like serving the mac without the cheese). These crate lights are awesome! Because of my well known obsession with Asian cuisine I decided to go with the Asian burger smothered in spicy red cabbage slaw, Hoisin bbq glaze, and pepper jack cheese. I was determined to go with the sweet potato tots for my side but was convinced to try the beer battered onion rings from the cashier. The burger itself was delicious, it had that cool heat from the slaw and that sweet and salty accompaniment of the Hoisin sauce, however, my one complaint (and MAJOR pet peeve) was that the entire bottom bun was soggy and soaked through. I was forced to one bun it halfway through the meal. All burger place should know that when a sauce is served on a burger you better butter n' toast those buns to prevent a tragedy like this from happening. The flavors were spot on but next time I would definitely get the sauce on the side. The onion rings were just okay for me and I found myself regretting my decision to not order the tots. They were wayyyy over-battered and greasy for my taste and they were kind of reminiscent of a funnel cake. 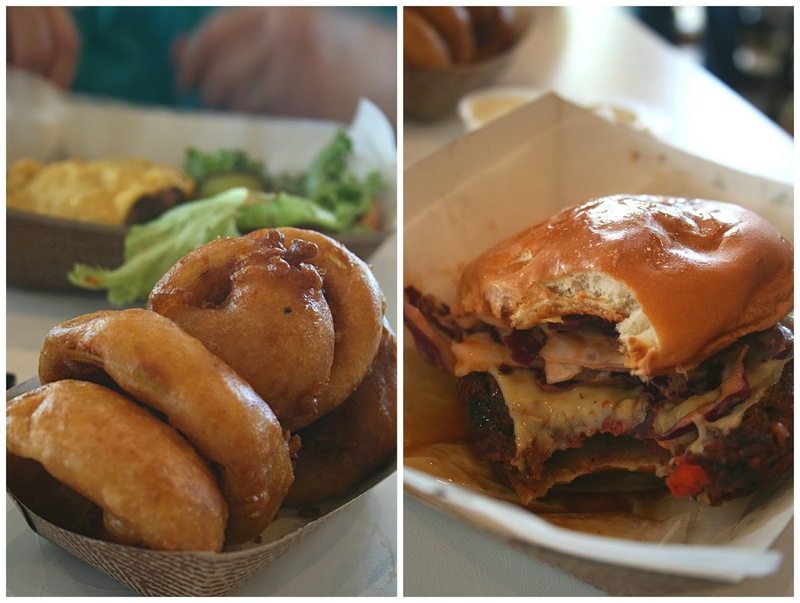 M Shack definitely serves up some unique burger flavors you won't find anywhere else in Jax. The flavors pack a punch but unfortunately mine had a soggy ending, I would recommend getting any sauce/glaze on the side just to be safe. As for the sides, I've heard the sweet potato tots are the way to go. Totally agree about the onion rings - would not get them again.